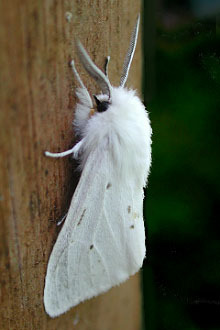 This is the second of the three snowy white Tiger Moths that appear in the yard. 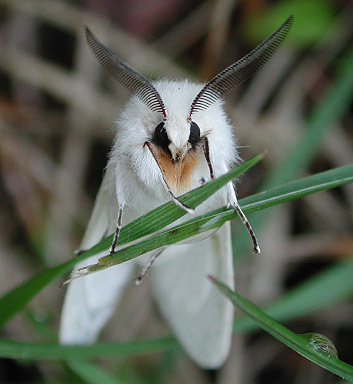 The first, Virginian Tiger Moth can be seen here. The most recent, Fall Webworm is here. What sets this one apart from the others is that dirty-orange "bib", which is actually covering the inner basal segment of the legs (coxa). Also, in Agreeable the abdomen is a clean white, unlike the orange and black-colored abdomen in Virginian. The upper wings in this one are lightly spotted with black. I have seen quite a bit of variability in this.